Approaching two decades as one of the internet's premier MUDs! Welcome friend! Come immerse yourself in one of the largest and most advanced online games in existence. With thousands of players, tens of thousands of rooms, hundred of areas, dozens of quests and a billion possibilities, 3Kingdoms offers you endless worlds of adventure! 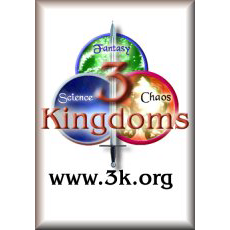 Simple enough to learn, yet complex enough to challenge you for years, 3Kingdoms is a colossal adventure through which many years of active and continued development by its dedicated coding staff has grown to be one of the best MUDs you will ever play. creatures so bizarre that they have yet to be categorized. During their exploration of the realms, players have the opportunity to join any of well over a dozen different guilds. These guilds, like the Knights, Necromancers and Juggernauts and many others, allow the player to become part of a powerful team and gives them a place to socialize with other players. Guilds also grant special, unique powers to the player, furthering their abilities as they explore the vast expanses of each realm. Add in the comprehensive skill system that 3K offers and you are able to customize your characters more than anywhere else. 3Kingdoms combines all these features, and so much more, to give the player an experience that will stay with them for the rest of their lives. Come live the adventure and find out for yourself why 3K is the best there is!